In 1977, Intel introduced 8085, the last eight-bit microprocessor. Today there are over 200 million such microprocessors embedded in various electronic devices, and its production will continue in the future. In 1978, a microprocessor 8086 – 16 bit microprocessor was produced with a run rate of 2.5 MPa. Its microprocessor memory is up to 16 times more as high as 1MB. Аs an upgraded version of Intel 8008/8080 processors, Intel created the well-known 8085 processor. In this processor, 2 new instructions were added to turn on / off the 3 terminals and the Input / output ports, and simplified the hardware using only a + 5V (Volt) current, as well as added a time impulse generator and circuit control circuit. This microprocessor requires few hardware components, but their placement and functionality can provide very high work efficiency. The microprocessor 8085 is very similar to microcontrollers, such as PIC 16f84, which are widely used in process control. According to its power, 8085 cannot be compared to Pentium microprocessors, but it will be used for a long time because it has a great application in simpler electronic devices that do not require such powerful processors. This is an eight bit processor, which is processing data with a size of a byte. It has a clock speed generator with a digital clock speed of 8 MHz, a special controller for intermittent operation and timing control. It has access to memory with a capacity of 64KV, basically there are 16 address pins for direct addressing of the memory space (216 = 64K). The AH version has a 20% lower power consumption than the normal 8085 processor. decimal, binary and arithmetic with double precision. 8086 are third-generation microprocessors. 8086 has a 16 bit data bus. 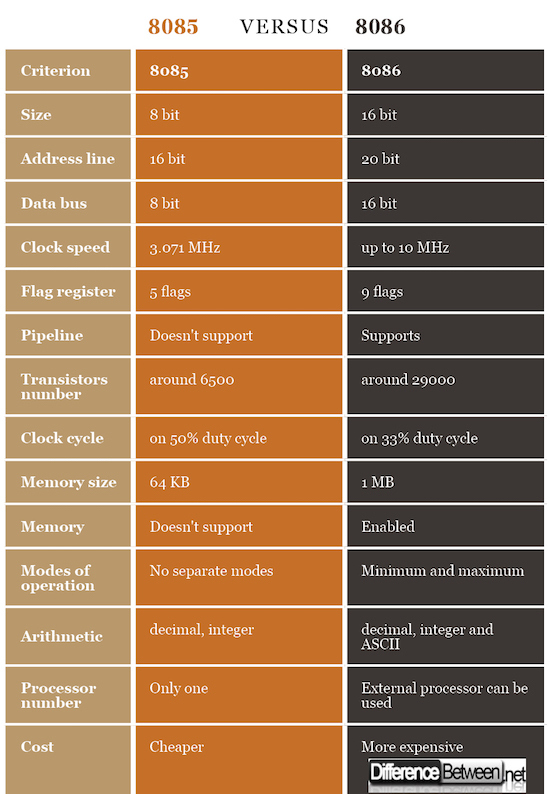 8086 has a memory with a capacity of 1 MB (220) and 20 bit addresses are used to address the memory locations. 8086 has a 40-pin housing and uses a 5V power supply. Depending on the size and complexity of the programs, it can work in two modes – minimal and maximum. 8086 contains separate units that simultaneously perform some phases (transfer of operating code from memory to microprocessor – opcode fetch, operand transmission if requested – read, effective execution – execution, return of the result to the memory – write). 8086 works exclusively in realistic mode of operation. Starting from 8086 to 80286, the following addresses are in use: registers addressing, immediate, direct, registering indirectly, based, indexed, based-indexed and based-indexed with displacement. First of all, 8085 is an 8 bit, while 8086 a 16 bit processor. 8085 uses 18 bit address line, 8086 a 20 bit one. The first has 8 bit, the second 16 bit data bus. The 8085 microprocessors’ clock speed is 3.072 MHz. 8086 was initially limited to 5 MHz, but it goes up to 10 MHz nowadays. The flag register in case of 8085 contains 5 flags, in case of 8086 – 9. 8086 is the only one that enables pipelining. 8085 integrates lower number of transistors – around 6500. 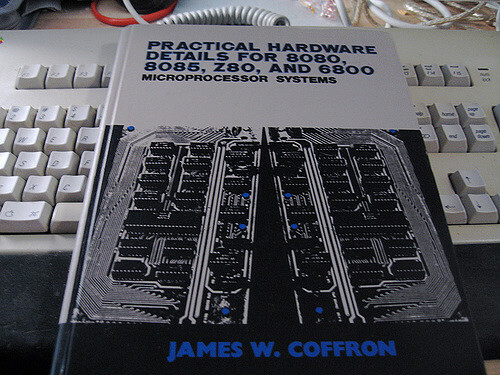 8086 has more transistors – about 29000. 8085 works on clock cycle with 50% duty cycle, while 8086 with 33%. 8085 uses 64 KB memory, 8086 1 MB. The later version supports memory segmentation. 8086 can work on minimum and maximum mode. 8085 supports decimal and integer code, while 8086 also supports ASCII. 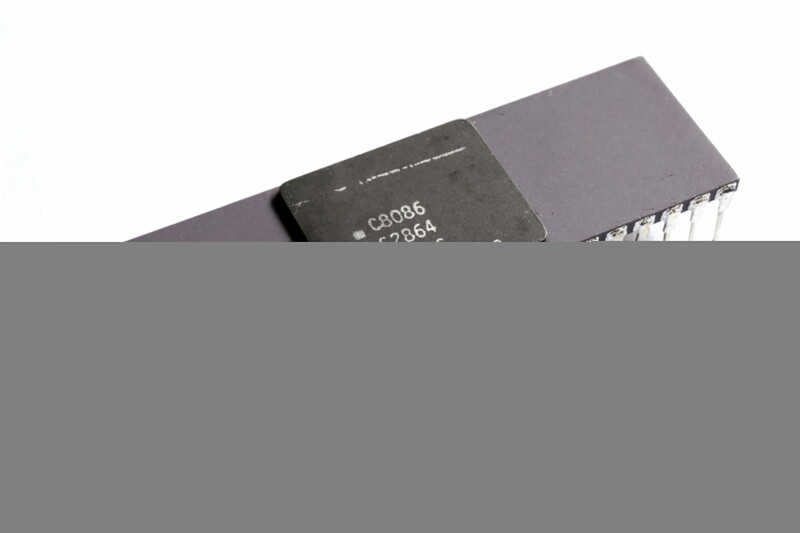 8085 uses only one processor – 8086 can utilize an external one. The 8085 microprocessor was designed by Intel in mid – 1977. It is compatible with microprocessor 8080 and require less additional hardware, which makes it possible to create a simpler and cheaper computer system. This microprocessor has a Von Neumann architecture, which involves mixing the operating code and the operand. The microprocessor 8085 requires: CPU, memory, and I / O model. In 1978, Intel launched the new 8086 processor, and a year later, 8088, which is distinguished only in the address line. This is the first 16-bit processor. The 8086 has a 20-bit data bus that allows storage of a maximum of 220 = 1MB data. For information, this processor contains about 29,000 transistors, and from this processor type there are different processors operating at 5.6 or 10 MHz operating frequency. The novelty of these processors was the segmentation of the memory space, that is, its division into 4 segments of 214B (bytes). Emilija Angelovska. "Difference Between 8085 and 8086." DifferenceBetween.net. March 26, 2018 < http://www.differencebetween.net/technology/difference-between-8085-and-8086/ >.